In the TBH Spotlight features, we focus on special items from TARL's collections as well as ongoing research at the lab, providing insights into the various analytical techniques used to interpret artifacts and archeological sites. Check back regularly for new additions to this section. Caches and burials connect us in a very personal way to past events and the traditions of ancient cultures. In 1936, archeologists from The University of Texas working in the arid Lower Pecos canyonlands of southwest Texas uncovered what they described as “a find of unusual interest”: a twined-fiber bag, filled with an array of objects, and still securely fastened after more than 4000 years. Recent studies of this TARL collection, including technical analyses of stone and bone tools and radiocarbon assays of plant remains, are helping to unlock some of its secrets. More than 80 years after its discovery, we are featuring this rare and little-known collection on TBH and rethinking its significance and meaning. Patterns in the shape and technology of stone tools can provide evidence of past human behavior, technology, movement, and the flow of goods or ideas across a landscape. Today, many anthropological research studies featuring shape analysis of materials, ranging from pottery vessels to Australopithecine and early Homo crania, use a method known as Geometric Morphometrics. Archeologist and Associate Editor of Texas Beyond History, Heather Smith, discusses the Geometric Morphometric method and her use of this approach in her research on the human occupation of the American continents at the end of the last Ice Age. 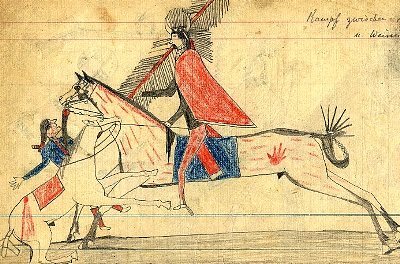 A set of Plains Indian ledger drawings continues to mystify researchers more than 50 years after its acquisition by The University of Texas. Much of what is known about the Schild Ledger Book raises questions—from the identity and tribal affiliation of the artists who created the drawings to the circumstances of the book coming into the possession of a family in Germany. Recording a way of life as it passed into history, these colorful and often complex depictions of battles, buffalo hunts, heroic deeds, and traditional customs have been variously ascribed to the Kiowa, Cheyenne, Arapaho, and Comanche. In this section, we examine questions surrounding the book and provide an online gallery of prime examples from this collection at TARL. A wealth of information about past environments and prehistoric human behavior can be gleaned by studying these seemingly inconsequential mollusks. TARL researcher Ken Brown leads us through the painstaking but fascinating proccesess involved in their study and explains their value as indicators of past climatic conditions and prehistoric dietary habits. 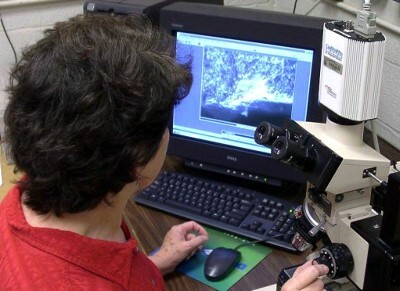 Using a high-powered microscope and a special reference collection of replicated stone tools, TARL analyst Marilyn Schoberg studies microwear patterns on ancient tools to try to determine how they might have been used and on what materials. In some cases, tools were not used in ways we would expect, based on morphology alone, but hold a complex—and sometimes unexpected—history of use. This feature describes some of the processes involved in the analysis and some of her more interesting findings.